Let Bessie the cow bring a cheerful greeting to all who visit your garden or yard. 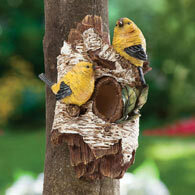 Our adorable garden sculpture is crafted from weather resistant polyresin. Mount her face and a top and bottom leg on one side of a tree with her other legs on the opposite side and she appears to be happily peeking from behind. Head measures 6" long x 7" wide x 4-1/2" deep.